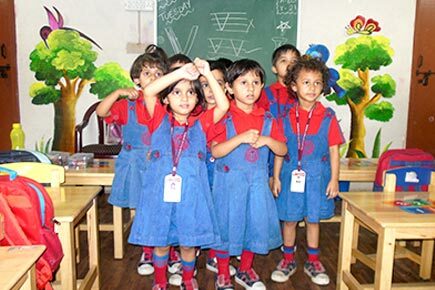 No formal test /examination are conducted for Pre-Primary. Promotion is given on the basis of continuous & comprehensive assessment (CCE) of a child's personality, physical & emotional development, academic performance & participation in school activities. The academic session is divided into four terms. Evaluation of the students is done on a 6 grade point scale for scholastic area and 4 grade point scale for co-scholastic area. The students are evaluated on various parameters through LSRW skills, projects, activities, daily class performances as well as written test (Cycle Test) throughout the term for all the subjects. Each assessment includes one Cycle test of 30 marks in each subject of 1 hour duration which is converted into 10 marks. The students are evaluated on various parameters through LSRW skills, projects, activities, daily class performances as well as written test (Cycle Test) throughout the term for all the subjects. Each assessment includes one Cycle test. Cycle Tests I and II are of 30 marks and 1 hour duration whereas Cycle Tests III and IV are of 50 marks each and 1 hour 30 minutes duration. Each Cycle Test marks are converted into 10 marks. In line with CCE system, General Knowledge, Physical Education, skills in Art, Music and Dance, Computers are assessed regularly. As per CBSE, the dual scheme of examination (Scheme I & Scheme II) for class X shall remain discontinued from 2017-18 onwards. The entire year is divided into two terms i.e. Term I & Term II. Each term have internal assessment of 20 marks and written exam of 80 marks. Each Internal assessment includes one periodic test (10 marks), Notebook Maintenance (5 marks) and Enrichment Activity (5 marks). 1. Periodic Test I is conducted in the month of July for 30 marks in each subject for 1 hour duration which is converted to 10 marks. September - As per prescribed syllabus. 3. Enrichment Activities - 5 marks-total 3 activities are conducted in a term. Average of all 3 are taken into account. These activities are graded on 3-point grading scale (A to C) and have no descriptive indicators (A=Outstanding, B=very Good, C=Fair). Also, there is no up-scaling of grades in scholastic subjects on the basis of Co-scholastic areas. Students are graded for discipline as per 3 points grading scale (A-C). Test Month Time Duration Total Marks Remarks This covers regularity, assignment completion, neatness & Upkeep of notebooks. Though, it is assessed continuously but accounted in each periodic cycle and average of best two is considered /counted. One activity in each periodic cycle and average of best two is taken into account. Periodic Test - I July 45 minutes 20 marks To be converted out of 10 marks. Average of best two is taken into account. Annual Examination for class IX is conducted in the month of March for 80 marks in each subject. Board Examination for class X is conducted in the month of March for 80 marks in each subject. These activities are graded on 5-point grading scale as in practice (A to E) and have no descriptive indicators. There is no up-scaling of grades in the scholastic subjects on the basis of Co-scholastic areas. Students are graded for discipline also as per five point grading scale (A-E).